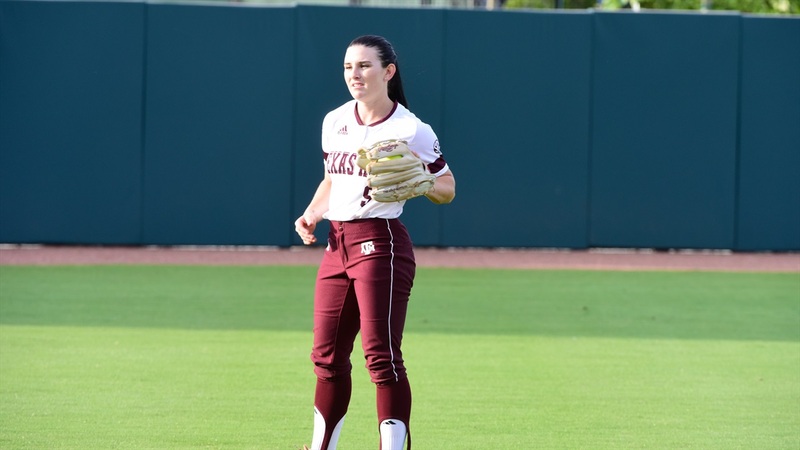 Deep flies from Sarah Hudek, Kristen Cuyos and Riley Sartain mixed with a strong offensive output saw Texas A&M (42-16, 13-11 SEC) take down McNeese State, 10-1, in the College Station regional at Davis Diamond. A&M set the tone early by scoring in the top of the first inning. After Keeli Milligan worked a lead-off walk and then stole second. Sarah Hudek cashed in by driving her home on an RBI-double down the right field line. Tori Vidales kept the line moving by driving in Hudek with an RBI-single back up the middle. McNeese State answered in the bottom of the inning. After a base hit, a walk and a fielder’s choice, Alexandria Saldivar took a pitch the other way for an RBI-single into right field, scoring Justyce McClain. The Aggies extended their lead shortly thereafter. Milligan reached on a base knock to left, and Hudek launched a two-run shot over the wall in center field. When Milligan was struggling, we put Hudek in the one, and I think we did some damage to her in the sense it wasn’t a place where she felt as confident. So we’ve locked back into that two spot, and she and Keeli have just been a dynamic one-two combination there. Sartain added a long ball of her own in the top of the third, taking a pitch to deep left center field to extend the Aggie lead. A&M struck again in the top of the fourth. Hudek reached base with a double, and Ashley Walters hit a single to move her over. Hudek then scored on a wild throw to third base. Sartain continued her monster day at the plate with a two-run single to left field. When it was all said and done, she finished 2-3 at the plate with three runs driven in. Cuyos capped off the scoring by cranking a two-run homerun in the top of the sixth inning off of the scoreboard in left field. Milligan, Hudek and Sartain all finished the day with multiple hits. Harrington started in the circle and worked two innings, giving up one run before giving way to Lexi Smith in relief. Harrington kept the Cowgirls off of the scoreboard for the most part. She navigated around a bases loaded jam in the second inning by inducing a double play. Smith (10-2, 1.33 ERA) took over in relief in the third inning and tossed three scoreless innings on her way the win. Evans said she will consider Harrington as an option for tomorrow’s game given she didn’t throw a lot of pitches and her outing was cut short. A&M will return to the diamond in the regional final tomorrow afternoon at Davis Diamond. The Aggies will face PVAMU, McNeese or Baylor. First pitch is set for 1:30 p.m. Whoop! Gig 'em ladies. Let's go all the way!